Conakry (Sosso: ) is the capital and largest city of Guinea . Conakry is a port city on the Atlantic Ocean and serves as the economic, financial and cultural center of Guinea with a population of 1,931,184. Originally situated on Tombo Island , one of the Îles de Los , it has since spread up the neighboring Kaloum Peninsula. The population of Conakry is difficult to ascertain, although the U.S. Bureau of African Affairs has estimated it at 2 million. Even given this uncertainty, Conakry makes up almost a quarter of the population of Guinea. According to a legend, the name of the city comes from the fusion of the name "Cona", a wine and cheese producer of the Baga people, and the word "nakiri", which means in Sosso the other bank or side. Conakry was originally settled on tiny Tombo Island and later spread to the neighboring Kaloum Peninsula, a long stretch of land wide. The city was essentially founded after Britain ceded the island to France in 1887. In 1885, the two island villages of Conakry and Boubinet had fewer than 500 inhabitants. Conakry became the capital of French Guinea in 1904 and prospered as an export port, particularly after a (now closed) railway to Kankan opened the large scale export of groundnut from the interior. In the decades after independence, the population of Conakry exploded, from 50,000 inhabitants in 1958 to 600,000 in 1980, to over two million today. Its small land area and relative isolation from the mainland, while an advantage to its colonial founders, has created an infrastructural burden since independence. In 1970, conflict between Portuguese forces and the PAIGC in neighbouring Portuguese Guinea (now Guinea-Bissau ) spilled into the Republic of Guinea when a group of 350 Portuguese troops and Guinean dissidents landed near Conakry, attacked the city, and freed 26 Portuguese prisoners of war held by the PAIGC before retreating, failing to overthrow the government or kill the PAIGC leadership. Matoto – home to Gbessia Airport . The five urban communes make up the Conakry Region, one of the eight Regions of Guinea, which is headed by a governor. At the second-tier prefect level, the city is designated as the Conakry Special Zone, though the prefecture and regional government are one and the same. At two million inhabitants, it is far and away the largest city in Guinea, making up almost a quarter of the nation's population and making it more than four times bigger than its nearest rival, Kankan . Conakry is Guinea's largest city and its administrative, communications, and economic center. The city's economy revolves largely around the port, which has modern facilities for handling and storing cargo, through which alumina and bananas are shipped. Manufactures include food products and Housing Materials.An average Guinean in Conakry will get a monthly wage of about 225 000 GNF or about $45. According to Koppen climate classification, Conakry features a Tropical monsoon climate. Conakry features a wet season and a dry season. Like a good portion of West Africa, Conakry's dry season is influenced by the harmattan between December and April. As a result relatively little precipitation falls in the city during these months. However, unlike a good portion of West Africa, Conakry's wet season sees an extraordinary amount of precipitation. As a result, Conakry averages nearly 4,300 mm (169 in.) of precipitation per year, earning the city a tropical monsoon climate classification. Attractions in the city include the Guinea National Museum, several markets, the Guinea Palais du Peuple, Conakry Grand Mosque (which was built by Ahmed Sékou Touré), the city's nightlife and the nearby Iles de Los . For the relations between the 2007 crisis and infrastructure in Conakry, see: * Q&A: Guinea emergency, BBC World Service. 13 February 2007. * Youths Chase Staff From State Electricity Offices, Protesting Power Cuts, Oct 25, 2007 (UN Integrated Regional Information Networks/All Africa Global Media via COMTEX). * IRIN In-Depth, Guinea: Living on the edge. UN Office for the Coordination of Humanitarian Affairs, January 2005. * GUINEA: Power cuts stop for football, 26 January 2006 (IRIN) * Guinea protests over power-cuts, Alhassan Sillah: BBC, Conakry, 31 January 2003 * Conflict history: Guinea. International Crisis Group, updated 11 May 2007. For the urban infrastructure and its history, see [ http://www.worldbank.org/urban/forum2002/docs/diallo-pres.pdf. M. Dian DIALLO. Street Addressing And Basic Services In Conakry, Guinea]. Presented at the Urban Forum/ World Bank - Washington DC - 2 April - 4 2002. Conakry's dark streets turning orange. James Copnall, BBC News, Guinea . 23 November 2006. Conakry the Capital: history of the city at site of expat artist. Kids in Guinea Study Under Airport Lamps, RUKMINI CALLIMACHI The Associated Press, Thursday, 19 July 2007. Guinea's Telecommunication Infrastructure, United Nations Economic Commission for Africa (UNECA), 1999 figures. Office National du Tourisme, République du Guinée. 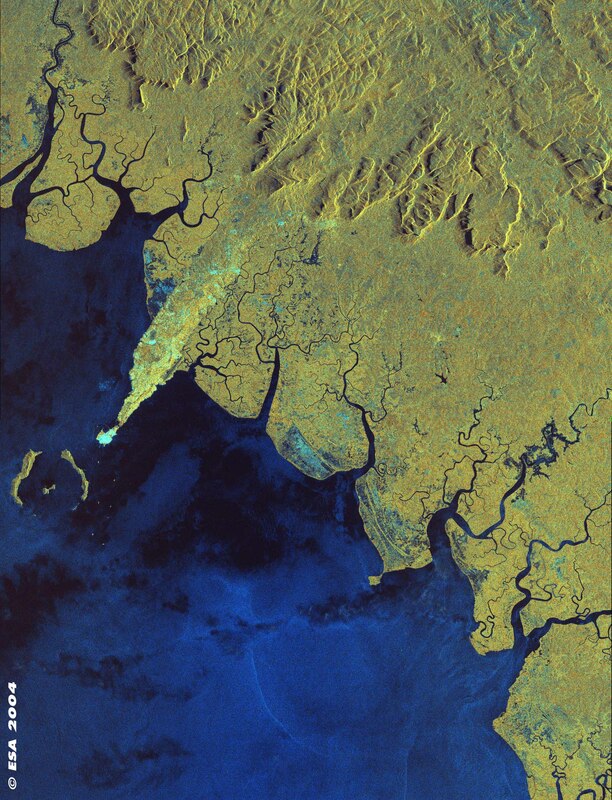 Satellite image of Conakry and the Kaloum Peninsula, from the European Space Agency 's Envisat: image description at http://www.esa.int/esaEO/SEMAV21XDYD_index_1.html.